Located at Madrid Barajas International Airport; The Petit Palace Madrid Aeropuerto Hotel from the High Tech chain of hotels is ideal for business or leisure travelers to Madrid. The area is well serviced by public transport and the city centre is only 15 Km from the hotel. There are many hotels; conferences venues and businesses in the vicinity. All 81 large and modern bedrooms at High Tech Madrid Aeropuerto are well appointed with king size bed; Satellite TV; Phone; Air conditioning; In-room safe; Hair dryer; Trouser Press; Alarm Clock. As all rooms are designed with business in mind guests will also have high speed internet access; desk with extra phone and desk lamp. Facilities in the hotel also include restaurant; snack bar; hotel bar; Swimming Pool; Meeting rooms and symposiums; Business services; Parking; Laundry and Ironing Service. The hotel offers an excellent restaurant serving the best in local and international dishes. There is also a hotel bar and a small snack bar for convenient meals. 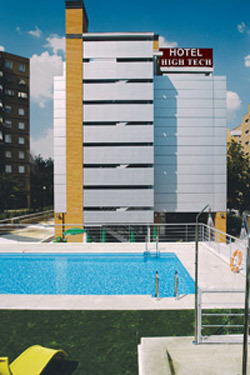 Location: The Hotel High Tech Madrid Aeropuerto is located on Galeon St adjacent to the Airport and Via Servicio. The hotel is outside Madrid city but well serviced by public transport. The Metro line number 8 runs from the Airport through the city and to Nuevos Ministerios station. There are shuttle buses running between Hotel High Tech Madrid Aeropuerto and Madrid Airport as well as public buses to the city. 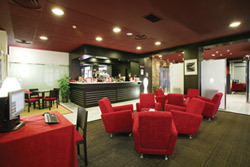 Madrid city centre is easily accessed by taxi or public transport from The Hotel High Tech Madrid Aeropuerto. In the city there is a choice of historical and cultural attractions such as Plaza Mayor; Puerta Del Sol and Palacio Real. Along the Gran Via guests can enjoy the many shops; restaurants and bars on offer in the Spanish capital. IFEMAS's exhibition centre and Palacio de Congresos are located close by with easy access transport.